Here is a clip from a 1975 Doris Day special in which she and John Denver sing a medley of “sunshine songs”. This video, like the sunshine in Denver’s “Sunshine on My Shoulders”, almost always makes me smile. After many weeks of running second or third, greater Syracuse has again climbed to the top spot nationally – our accustomed status – when it comes to total snowfall for large cities. As of Wednesday, according to Jessica Rennells of the Northeast Regional Climate Center at Cornell, Syracuse was up to 114.7 inches of snow for the season. The season’s snowfall has certainly surpassed last year’s record low total of 50.6 inches of the white stuff but so far we have not reached our average of about 120 inches, although we are just under 5 inches away from doing just that. 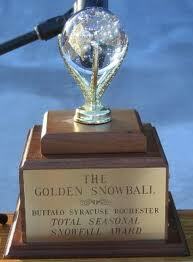 I’m not a greedy person and I am very much in favor of letting Rochester or Buffalo or Albany or Binghamton have possesion of the Golden Snowball Award for as long as they would want it….we’ve had it here far too many years in the past. Check out the history here. Even though the recent weather has not been Spring-like, that will soon change and in a few months we will be complaining about the heat. Such is life in Central NY.